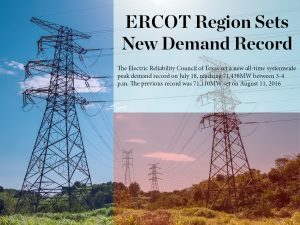 ERCOT announced record demand across the state on July 18 as high temperatures and the state’s continued population and economic growth combine for increased electricity needs. ERCOT expects to have enough capacity during the upcoming continued heat wave, although the demand record of 71,438MW is expected to be broken again. While no service interruptions are currently expected, conservation measures are always a good idea. Air conditioning drives up the summer demand, and that is where you can make the largest impact both on your energy bill and to help reduce demand. Using blinds and curtains to reduce radiant heating within your home. Keep clean filters in your air conditioner to make sure it is running efficiently. If possible, avoid the use of cooking, laundry and other appliance use during the peak hours of 3-7 p.m.
Additional summer savings tips from the Department of Energy.